E3: Is the video game expo past its prime? Over the past 17 years, the sprawling E3 video game expo has been the launch pad for innumerable smash hit games and innovative consoles. But some say the flashy, tech-centric exposition may no longer have the soul or relevance it once did. The Electronic Entertainment Expo, as it is also known, is a three-day conference run by the Entertainment Software Association (ESA), a trade body which invites video game journalists, retailers and other industry insiders to the Los Angeles Convention Center to critique, and in some cases swoon over new products from industry giants including Nintendo and Sony. Roughly 45,000 of those tech heads are currently invading downtown LA for the much-anticipated event, which officially kicks off tomorrow. Messy-haired video game reporters with stacks of accreditation badges slung around their necks are already being picked up and shipped to press conferences around the city by shuttle buses, owned by Microsoft, Sony, EA and Ubisoft. The four companies are poised to power up the smoke machines for the unveiling of their new products a day before the start of the expo. This year's E3 could be huge for Nintendo, as the pioneering video game company is expected to release the next Wii console, currently dubbed Project Café. Other new products due to premiere include Activision's Call of Duty: Modern Warfare 3, Irrational Games' Bioshock Infinite, Bethesda Softwork's The Elder Scrolls V: Skyrim and the next generation portable console from Sony. Beyond the headline grabbers, some gamers say the conference does not have quite the same weight or allure it once did; they believe that E3 has become too focused on glitzy presentation, while also limiting its scope to industry insiders rather than the gamers themselves. In 2005, almost 70,000 invitees and nearly 400 vendors stormed the convention centre, filling its halls to capacity for three straight days. The 2006 expo played host to 60,000 invited guests. But by 2007, ESA had decided to reduce the numbers dramatically, allowing less than 5,000 visitors into the 720,000 sq feet (219,000 sq metres) space. "E3 has somewhat fallen from grace with actual gamers," said Matthew Hurst, a Philadelphia-based web developer and video game enthusiast. "Ten years ago was when all the huge news was coming out of E3, but in the early 2000s it received a bad reputation for being nothing more than a marketing tool and failing to excite fans in a way it once did." Instead, Mr Hurst favours the Penny Arcade Expo (PAX), a semi-annual US video game festival that is open to the public, and Europe's Gamescom trade fair, which he believes connects more directly with the gamer community. In recent years, there are signs that the organisers of E3 have sought to make it more accessible. The event is still not open to the public, but an increasing number of "regular" gamers are to be found there, usually under the guise of bloggers or competition winners. By 2009, attendance had jumped back to more than 40,000 visitors, and this year, the ESA expects to welcome guests from over 80 countries as well as 200 video games companies. But the more populist tone of E3 has done nothing to dispel accusations of extravagance and even hubris. "It's a show of force. It's the video game industry all coming together to be like, 'Bam! We're the video game industry, and we're a multi-billion dollar industry - look how impactful we are on the world,'" said Chris Kohler, video games editor for Wired.com. "It's like being in an awful science fiction movie with giant budget." But Mr Krohler claims that if game companies did not put on as big a spectacle, the conference would "seem very limp". N'Gai Croal, a video game design consultant, complained that in previous years there was a "cold war going on in terms of the decibels" being blasted between competing video game companies inside the expo. Luckily, Mr Croal said, the sound levels were reduced dramatically at last year's expo for the journalists and retailers strolling the game booths. 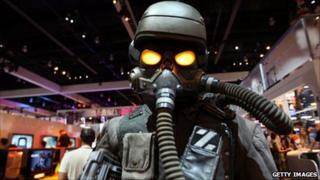 E3's organisers believe the scale of the event is appropriate to an industry which, as is often stated, in on an earnings par with movies and music. "That's the beauty of what it is - it puts everyone under one roof and gives them a level playing field to show off their products," says Richard Taylor, senior vice president of communications and industry affairs at ESA. "If you are a gamer, this is nirvana; if you are just interested in technology, this is a place you'll want to be; if you want to see where the future of entertainment is, there's no place better than Los Angeles is next week." Back in Philadelphia, Matthew Hurst explained that he will happily remain on the east coast for the entirety of the conference. Although, he confesses, that is more down to being left of the guest list than a point of principle: "I guess I would go, if invited. I do really want to see what happens with Nintendo."